Welcome to the Town of Castle Rock! The charming town of Castle Rock is located approximately 15 miles from southern metro Denver, and The Denver Technological Corridor where a large majority of high tech employment companies reside. Castle Rock, named after the towering rock in the middle of town, was originally a mining town, and utilized the rail road for transportation of it's famous rock, Rhyolite which was shipped all over the front range area. For further information on the history of Castle Rock, please click Here. 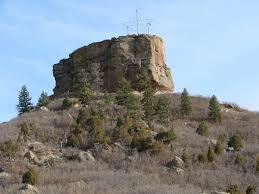 Castle Rock, Colorado is a fast growing community in beautiful Douglas County of Colorado. Like many newer communities it is seeing dramatic change in just a few years. Nestled where the high plains meet the Rocky Mountain foothills Castle Rock offers a life like no other. Castle Rock, Colorado - where the small town character is combined with big city amenities. Our climate is known as among the nation’s best, with more than 300 days of sunshine and an average of 255 days of sunshine a year. The average high temperature is 85 degrees in the summer months and 44 degrees in the winter. Annual snowfall is 62.2 inches and the average humidity is 40 percent. Castle Rock provides several indoor and outdoor leisure opportunities including the Community Recreation Center, 400 acres of parks, and the soon-to-be opened Hidden Mesa open space. Home to several spectacular public and private Golf Course including the Red Hawk Ridge municipal golf course, Pete Dye designed Plum Creek Country Club and Golf Course, The Country Club at Castle Pines and The Ridge at Castle Pines North. Residents and visitors can also enjoy a full range of shopping experiences from downtown boutiques to department stores and the Outlets at Castle Rock, or enjoy dining on anything from fast food to gourmet. At approximately 6200 feet above sea level, Castle Rock is higher in elevation then Denver, and may be considered a "foothills' location, even though it is south, rather than west of the metro area. Due to the higher elevation, Castle Rock residents enjoy the eye candy of towering Ponderosa Pine Trees, Gamble Oak, expansive rock outcroppings, and massive bluffs and buttes. The views and vistas here are amazing! Housing in the Castle Rock area exists from the mid 100's to several million dollars, depending on size, location and view. Here is an overview of the neighborhoods in Castle Rock. Olde Towne Castle Rock - Much of the housing in this area has kept the charm and character of yester year. Employees of the Santa Fe Railroad and the miners originally lived in these bungalows. The majority of these homes are within walking distance of the historical downtown district, full of award winning restaurants, quaint shops, coffee shops, and pubs. This area has experienced a resurgence in growth, and some of the older homes have been scrapped and built with new homes, replicating the charming exteriors on the outside, but the up to date comforts of modern day design living on the interior. Prices in this area range from the mid $100's to the $600's.